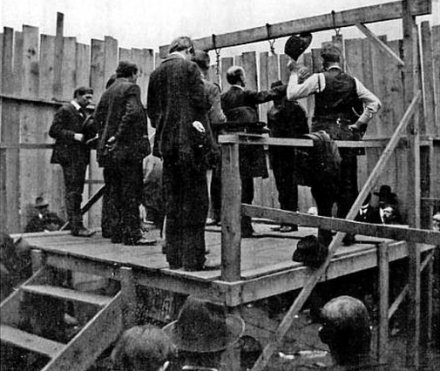 On this date in 1900, Sonnie (or Sonny) Crain and William “Bill” Brown, both 40, and John Watson, 59, were hanged side by side a quarter-mile from the Warren County Jail in McMinnville, Tennessee. This was an integrated execution: Brown and Watson were white, and Crain was black. The gallows was contained in a 30-by-30-foot enclosure and had been built especially for this day’s event. There were twenty official witnesses. A crowd of about two thousand waited outside the fence, hoping to catch a glimpse of the execution, but their view was obscured by a canvas curtain drawn hanging from the top of the gallows. Watson, a Civil War veteran who’d fought at Shiloh, had committed his crime on December 21, 1898. He shot a neighbor, 40-year-old James Hillis, white, after an argument about some corn and some fence rails. Hillis walked away from the fight. Watson fetched his shotgun, waited for his chance then shot Hillis on the road that evening, in front of the victim’s daughter. Hillis lived for a few hours after the shooting and named Watson as his attacker. The killer had a reputation for violence; he’d allegedly shot and seriously wounded a black man in a drunken rage in 1893, but was acquitted at trial. He had also served a term in federal prison for making and selling moonshine, and he was stone drunk on his own apple brandy at the time of Hillis’s murder. His defense, one of temporary insanity caused by alcohol, didn’t fly with the jury. Bill Brown was an illiterate tenant farmer; his victim was his wife of ten years, Mary Fults Brown. Bill was tired of his wife and attempted to leave her, but everywhere he went she just followed him. He and his brother, John “Bud” Brown, decided she had to die. Bill told Rogers the shooter had fired through the open window, but this didn’t make sense because Mary had been asleep beside her husband and Bill was lying between her and the window. He claimed he didn’t own a gun, but a search of the house turned up a recently fired pistol hidden in a trunk. It didn’t take long for Bill to crack. He confessed to his role in Mary’s death and implicated his brother Bud (who, incidentally, had a prior record for beastiality with a mare). While Bud Brown was awaiting his first trial, Bill was waiting his second trial, and John Watson was awaiting the outcome of his appeal, they were all housed in a jail cell with Sonnie Crain. Crain had been convicted of second-degree murder for shooting Will Snellings in a dispute over a craps game, and was sentenced to ten years in prison. He was housed in the jail while his case was under appeal. On May 22, 1899, as the Brown brothers slept, Crain bludgeoned them both in the head with a piece of his bed, killing Bud and critically injuring Bill. He later said the brothers had threatened him and he’d acted in self-defense, but the authorities had another theory as to motive. The jailer was away at the time of the murder and had placed his wife in charge, and there was some evidence that Watson and Crain had conspired together to murder their cellmates in order to create a diversion so they could escape when the jailer’s wife came to get Crain. 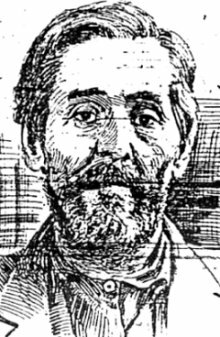 Crain (who denied any plan to escape from jail and insisted to his dying breath that he’d acted in self-defense) was convicted of Bud Brown’s murder and sentenced to death. Although Bill Brown’s wounds were very serious and he was not expected to live, he recovered from his injuries in time to be hanged alongside the man who’d tried to kill him and the other man who’d possibly conspired in his attempted murder. So now that no one is confused … the three ultimately set to die in this labyrinthine affair were hanged at 11:50 a.m. on April 25, attended by two black ministers and two white ones. Crain and Brown were stoic, but Watson’s nerves failed him on the scaffold and he cried and shook as the noose was placed around his neck. It was the last public(ish) hanging ever in McMinnville.